My brother, Tori, and I were at the local swapmeet early one Sunday morning in the spring of 2004 when we came across a seller with 2 odd looking yellow "boats" on a small trailer. They really caught our eye and we stood mesmerized by them. Racey fiberglass hulls, super wide motocross motorcycle handlebars attached to a long sail boat-like keel, a prop and big wing facing the wrong direction and all the way level with the seat.......and that very 70's "DYNAFOIL" logo. All we could stand there and say was the same thing we hear now from people when we take one to the lake, "What the heck is that?" The longer we stood and looked, the more into them we became. It didn't take long to realize that these were hydrofoils and probably extremely rare. Unfortunately, the seller wanted $1,000.00 for them both and their custom side-by-side trailer. They were mostly in tact, but in terrible condition. A peek under the seat exposed an engine compartment full of rusty, dank water, leaves and debris and an engines that had certainly seen better days. In short, these things were shot. I have to give all credit to my brother Tori though. His famous last words still echo in my ears....and my wallet...."Oh, we gotta have these!" Ever the deal maker, he took the guy's information and over the next few weeks continued to call and check on their status. Eventually the guy traded them to his buddy and passed that guy's number on to Tori, who continued to pursue them. After about 2 months the "new" owner was ready to get rid of them, and informed Tori that there were actually 3 of them! He wanted $600.00 for all 3 and the trailer, which he'd just bought new wheels and tires for. Tori came up with the money. We picked them up in Lompoc, CA (about 60 miles south) and towed them to his place. The first task was to remove and disassemble one of the engines. It was seized solid from sitting in the water that had leaked into the engine compartment. We got it appart, but discovered the crank bearings were rusted and the crank would need rebuilt.....to the tune of about $400-$600! Fortunately, the Dynafoils used a Chaparral/Xenoah engine made by Fuji Industries in Japan. These engines were very common back in the 70's for use in snowmobiles and ultra-lite aircraft. 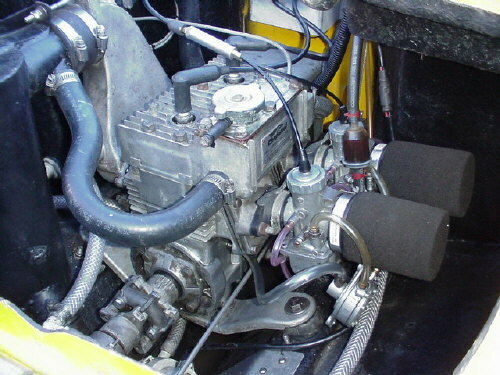 Although 2 of our Dynafoils were the later versions using the 440cc engine (G44BW engine code), the earlier Dynafoil used a 340 (G34BW engine code). Internet and ebay to the rescue! The guys on the Rupp Snowmobile Website were extremely helpful and I soon gained enough knowledge to start looking for an engine and carburetor. I found an NOS 340 engine on ebay for $200 and by the end of July had rebuilt the PTO drive, water pump, and prop gear box in one of the 1977's and it was ready to go in the water. A big pat on the back goes to Dynafoil inventor, Dave Cline. All of the Dynafoil's parts are still readily available, either from snowmobile, industrial, or marine sources. While Rupp snowmobile enthusiasts Brian Boucher, Bret Huer, and Bill Stull helped with engine specific advice, it was Dynafoil owners "BJ" Meinhardt and Scott Smith who came to my rescue for the Dynafoil specific information. Both were a wealth of knowledge on the craft and Scott was kind enough to send me several scans of his service manual. "BJ" sent us scans from an original dealer's brochure and exchanged emails and phone calls at length to answer all my unending stream of questions. I rode the Dynafoil 3 times between August and October 2004 and had a blast on it. The 340 engine combined with the 440's prop was not a good combination so taking off was very tedious, but once up to flying speed, it was pretty good. However, I'd seen Scott Smith's photos on "BJ's" website, and I had an original Dynafoil dealer brochure, so I knew how much performance I was lacking. Flying out of the water, huge wheelies, towing skiers! I had to do something to really bring the Dynafoil back to life and the 340 just wasn't cutting it. 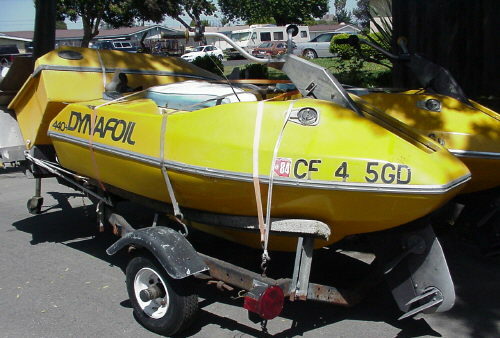 In September I found a guy in southern California selling a super nice side-by-side Sea Doo trailer, and another guy selling a 440cc Chaparral engine on ebay. I bought them both, had the trailer modified to fit the Dynafoil (a 1969 Sea Doo is now sitting next to it!) and then installed the 440 along with a pair of Mikuni carbs. We tested the Dynafoil with the 440 for the first time in November 2004 and what a huge difference in performance. As you can see in the photo below, it simply launches itself out of the water; and in a matter of just a few feet. Basically, as fast as you can roll on the throttle, it comes straight up and out leaving the hull completely above the water and only the prop and rear foil remain submerged. It is quite a rush! Dynafoil performance is a wild ride! I want to ride throughout the winter so I went down to the thrift store and purchased a nice used wetsuit and booties. It is just a thin 2:1 Spring Suit by O'neill, but what a huge difference! So, for Christmas I got a super warm Bodyglove Matrix 4:3, a pair of their "Bones" 1.5mil gloves with the fake suede/leather palms, and a pair of the new Ripcurl "3/5/7" booties. This suit is their top of the line and even at $300, plus $65 for the booties, is well worth it. It's made of the new generation stretch neoprene, with full glued seams on the inside, extra thick panel in the chest, a flood gate for your neck and back and a zippered back for ease of getting in and out. I highly recommend it! 52*F lake water and 35mph cruising speeds and I am completely warm. In fact, I can't feel the water. After a ride in March the engine sounded sort of "rattly." I started checking around and discovered that I could grab the crankshaft at the Lovejoy Coupler and rock the crank back and forth and hear a nice metallic clanking. I thought it was crank or rod bearings so I pulled the engine and removed the cylinder head, jugs("cylinders" in the 2 stroke world) and pistons. The crank was fine, but the piston-to-cylinder wall clearance was somewhere in the .010" range, when it should be around .0035"-.0055" according to the book. I sourced .20" over Rupp pistons from Joe at J&L Vintage Sales and had it bored to the low end of spec., .0035". That turned out to be mistake number one! Mistake number 2 came when I decided to install the much racier Rupp 440 cylinder head. The good used head I purchased came with it's original 150*F engine coolant thermostat. I thought, great, this will help keep the engine at the right tempurature at all times, even in the cold water. Big, big mistake! The Dynafoil doesn't use a thermostat. Instead, there is a water flow restrictor plate in the muffler right where the outlet coolant hose from the cylinder head hooks up. This restrictor plate has a 1/4" diameter hole drilled in it. Simple, effective, works perfect. Adding the thermostat did nothing but cause a hellacious overheating problem by screwing up the water flow, creating hot spots in the engine and eventually popping a coolant hose off 3 times! This catastrophic chain of events overheated the engine so bad that I ruined not one, but 2 ignition magnetos and had to be towed in on 2 seperate occations! On the final overheat (of my life I hope) the engine was so hot it melted one of my gloves as I was attempting to put the coolant hose back on again. Now, let's get back to the fall-out from mistake number 1, setting up the engine with too tight a tolerance on the pistons. This cause a cold seizure and would lock the engine up if I was doing anything over about 3/4 throttle. The engine would instantly stop and send the Dynafoil crashing down into the water. It would fire right back up again, and run fine, but this is no way to break in an engine. Finally, during one of the umpteen times I had the engine out in the last 2 months, I took it all back apart and discovered the new pistons were terribly scored from seizing both cold and hot. They were basically ruined, or nearly so. Not having an extra $200.00 to dump into another set of pistons, I gave them a good polishing using Emery Cloth and 220 and 320 wet/dry paper. They looked great, although the exhaust side of the pto piston still had some deep verticle scratches that I could do nothing about. Fortunately, the rings were perfect, as were the ring lands, and the area of the pistons above the rings. I had the machine shop bore the cylinders out to .005" and put the engine back together. I'm happy to say that it runs fantastic, pulls to 7,500rpm now and is once again very dependable and fun. I put 2 full tanks of gas through it on Memorial Day, and 2/3's of a tank 2 days earlier. Starts with about half a pull and stays only warm when blasting around. The next thing for me to work on is improving the Mikuni carb jetting for better full throttle performance. I'm looking forward to some great riding this summer and I'll be posting more movies to the "Movie Gallery" page. It's been a fantastic year of riding and learning! I've done quite a bit more work to the Dynafoil, and my riding skills are greatly improved. In June we attended the Fiberglassics (http://www.fiberglassics.com/) vintage boat gathering. This is a huge gathering of classic fiberglass boats from the 50s, 60s and 70s. We gave them a show with both the Dynafoil and our 1969 Sea Doo. The Dynafoil has proved to be extremely dependable. No more real problems, no more tow-ins. In fact, I'm back to my old ways of towing modern pwc's back to the Marina from time to time. I've been pretty consistant about riding it for a couple hours each week and my riding skills are much improved. No more big crashes and it's very very rare that I wind up having to swim back to it. I've discovered that if I simply stay on it, let it manuever beneath me and use the throttle and body english, I can get pretty wild without getting pitched off. Full air-borne, prop out of the water jumps are no problem, as are completely verticle wheelies. In fact, I've had it come over backwards on me and capsize! No big deal. Grabbed the front strut with my feet against the rub rail and flipped it right back over. Fired it up, let the bilge pump do it's thing and off I went. After breaking my front engine mount brace twice, I discovered my motor mounts were bad. I found some great motor mounts after tearing all of mine completely apart. Monkey Grip brand mounts are the only way to go. Info on buying them is now on the Parts Sources page. Since my original prop was pretty beat up, I tried experimenting with different props. Tried "Propco" brand props, 2 of them. One standard 9x9 and one 9x9 that they cupped for me. About $110 worth to be exact. After about 15min of run time, both had pieces of aluminum actually spawling off and pits were forming. Broke them both.....as in, sheared a blade completely off of them, in about 45min of ride time. Called the owner of Propco and was informed that he would not warranty either of them because I was using a "cheapy prop" on a high performance watercraft. Following my little Propco fiasco, I ordered a 9x9 Michigan Wheel prop. Michigan Wheel were OEM suppliers for Dynafoil. It's been bulletproof. In early November we a vintage pwc day at Lopez Lake in Arroyo Grande, California. We had the Dynafoil and the 1969 Sea Doo out, along with my brother's newly purchased 1985 Wetbike, and another guy's 1980's wetbike. It was fun to see all the old pwc's out at the same time. None are very fast, all have a unique sound and totally different ride, and it was just cool to see them all together. The wetbike's are a trip to ride. 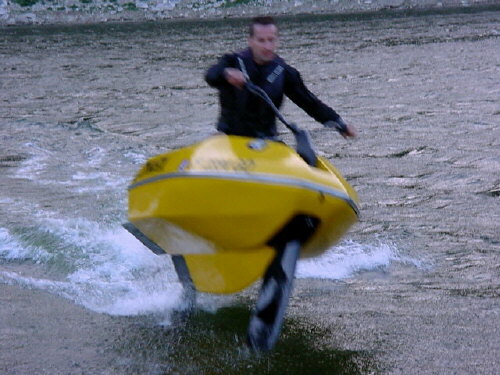 They're like riding a motorcycle, but with a waterski feel. They ride very rough in rough water when the skiis start slapping the top of the waves or wakes and then the jetpump starts cavitating. The Dynafoil is a much better ride and much more stable by a long shot! In early December I took the lower portion of the front strut apart and replaced all the bushings. Turns out these bushings are standard industrial items and are dirt cheap. See the Parts Sources page for more details. What a huge difference this has made. The Dynafoil is super straight and stable now. Feels like I'm riding along on a knife now. Much more control, a tighter feel, and the porpoising that was very common before is basically gone. During the strut repair I discovered that about 1/2" of the entire bottom of the strut had been ground compeletly off while being trailered by a previous owner(s). I replaced all the missing material by having aluminum rod TIG welded to the bottom of the aluminum area of the strut, and then giving it an airfoil shape with a die-grinder and flat file. I rebuilt the wood/fiberglass portion by drilling some small holes in the wood, inserting brass wood screws and leaving them stick out. Then I packed an entire tube of "Epoxy Steel Putty" into the area. As the epoxy cured, I formed it into the airfoil shape I wanted. Finally, I shaped it with a flat file and then repainted the entire strut. Time go buy another annual pass for the lake. 2006 is going to be a great year for riding! It's been quite year so far. I rode once back in January, but then 3 months of rain and a lake full of muddy water and floating debris kept me from coming back. I've ridden twice this month, and both times have ended in having to be towed back in to the marina. Last weekend, I broke the sheer pin that locks the prop to the prop shaft. On an outboard motor, the sheer pin is designed to snap if you hit something with the prop. Thereby saving the prop and drive. On the Dynafoil, these sheer pins are a joke. This is the first one I've broken, but 2 other owners that I keep in touch with have broken several. They are 3/16" diameter and way to frail for any sort of aggressive riding. The old thrashed and bent one had lasted me for 2 seasons and it was probably 20+ years old. I broke a brand new one in about 15 minutes. I'll be trying some 3/16" stainless rod next. Either that, or a grade 8 bolt shank. The real bad news is that yesterday one of the inner crankshaft bearings failed and locked up solid. Of course this happened at 7,300rpm at full speed. Nothing like instant silence followed by the Dynafoil crashing back into the water! I'm not sure what caused the failure, but the crank will have to be rebuilt by a specialist since it has to be pressed apart and pressed back together in order to replace the inner bearings. Say good-bye to about $350.00. Not a good start to the 2006 season.......stay tuned. 3 months of frustration and dead ends with regard to having the crankshaft rebuilt. I found a rebuilder in Minnesota who told me he could rebuild it, and rebuilt these cranks for the snowmobile crowd. Unfortunately, the rods, crank pins that the rods run on, and the big-end bearings for the rods are all no longer available from any source period. Now I don't take "no" for an answer. When someone tells me, "no longer available" I consider it a challenge and I'm usually successful. Well, not this time. I did find a source for crank pins but they would have needed about 1hr of machine shop time to be right. They do look nice as paper weights though. The rods are simply not available, no matter what, for the Chaparral/Xenoah version of the 440. For the Rupp version? Yes, you can get the rods and the bearings, but still not the crank pins. The Rupp 440 uses larger diameter pins, bearings and the rods have larger diameter big ends. The crank ball bearings are standard industrial 6205 bearings. I ordered Koyo's from "Applied Industrial Technology" for about $13ea plus shipping. I did find out a large bearing manufacturer does make a very similar needle bearing that would work on our crank pins. But, they are made specifically for John-Deere and are not available to the public. I was unable to get anyone to tell me what John-Deere item they were built for and that kept me from calling up John-Deere and ordering a pair. Of course crank seals come in the engine gasket kit from Winderosa, available through Manufacterer's Supply online. 3 months later I finally have my crank back, but it won't spin when set down into the case, let alone when the case is bolted together. What's really not funny about this is that I actually sent the case with the crank and specifically asked the rebuilder to bolt the case together with the crank installed and test spin it. This really bent him out of shape, because he, "Never has to do that." And, "He doesn't build engines." And, "He test spins the crank in his holder." The happy ending is that on August 26th I got the engine assembled and installed, including my rebuilding of the PTO water pump which had a failed bearing and seal right there behind the love-joy coupler. I replaced the sheer pin with one I cut from #304 3/16" Stainless rod (you need just under 1.5" for your sheer pin). The ride on August 27th was a big success. I didn't break a sheer pin and the Dynafoil ran excellent. Just in time for Labor Day Weekend!